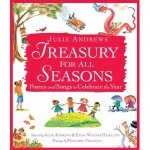 Julie Andrews’ Treasury for All Seasons: Poems and Songs to Celebrate the Year is a vast array of poems old and new joyously celebrates each special day of the year, telling of New Year’s resolutions, Valentine’s Day love, Easter parades, Fourth of July fireworks, and more. From the cold of winter to the new hope of spring, the brisk fall to the steamy summer, Caldecott Honor illustrator Marjorie Priceman’s vibrant watercolor paintings ring in every month of the year, bringing each season to joyful life.Featuring verse from favorites like Walt Whitman, Jack Prelutsky, and Langston Hughes and poetic lyrics from the likes of Cole Porter and Oscar Hammerstein, plus heartfelt introductions by Julie Andrews describing favorite family holiday moments. Featuring verse from favorites like Walt Whitman, Jack Prelutsky, and Langston Hughes and poetic lyrics from the likes of Cole Porter and Oscar Hammerstein, plus heartfelt introductions by Julie Andrews describing favorite family holiday moments, this is the perfect collection for families to share together.